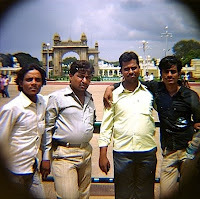 I mentioned earlier in the blog that I shot but four rolls of film on my recent trip to India. Here then is a selection of the photos I took; most of them are from Mysore and some from Bangalore. I used both a Holga and a Diana+ camera. The gallery is available from the Holga page.